Great shelf. Looks good, holds of plates (that's what I am using it for). Love that it is gold, is a nice accent color with my buffet and art. Very easy to put up. Highly recommend! Ordered the navy/blue version. They look great! They’re definitely narrow and made for pictures. Only thing is I wish it came with little risers to help raise the pictures up a little higher than the lip. Probably a personal preference, but the lip hides a good chunk of the picture! Definitely good quality and easy to put up! Recommend. Great color- I got the turquoise ones- nice ledge built in for holding picture frames/ sturdy! I got 3 if them and will end up putting one behind headboard as 3 on one wall would be too much! I bought the gold shelf, two of them. I LOVE them. There are fluctuations in the color, it is not a smooth coating of paint. But the grainier finish just adds character and keeps them from having glare. 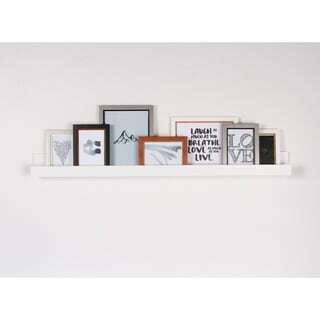 The hold picture frames well and knick-knacks as well.